The Carriages at Lower Gwynedd by Harth Builders offers a one-of-a-kind lifestyle in a coveted location, nestled in the lap of luxury. Spring House has been bustling with activity for some time now. Already known as one of the most desirable neighborhoods in Montgomery County, Spring House has sprouted a luxurious lifestyle center, offering nearly every possible amenity a nearby resident might want. 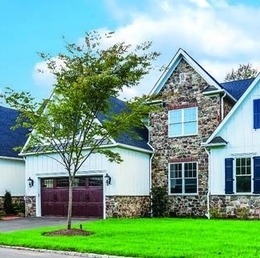 The newest addition contributing to Spring House’s renaissance: The Carriages at Lower Gwynedd, a smart-plan community of 11 luxury carriage homes by Harth Builders. Truly, the families who choose to make a home at The Carriages at Lower Gwynedd will discover a distinctive lifestyle. The idyllic setting provides views of preserved woodlands, while offering easy access to practically every shopping and entertainment hub in the Greater Philadelphia Area. If that weren’t enough, the enclave is within walking distance of the Spring House Village Shopping Center, which is anchored by a Whole Foods supermarket, a Starbucks coffeehouse, and the beloved BYOB Arpeggio. Even so, the greatest value of The Carriages at Lower Gwynedd comes from the homes themselves. Here, buyers have the opportunity to live in a dream home of their own design, with the added benefit of not having to concern oneself with everyday upkeep, landscaping, and nuisance maintenance such as snow removal. Buyers can choose from a menu of available models—the Avondale, the Channelle, and the Embrey—sized at a minimum of 3,500 square feet. Each home has an open floor plan, with an option for three or four bedrooms. Highlights include 10-foot ceilings on the first floor (9-foot ceilings for the second floor and basement), picturesque windows to make the most of natural light, walkout basements, and maintenance-free exteriors to include stone and high-quality James Hardie siding, as well as a 35-year shingle on the roof. Customization is a hallmark of this community. A homeowner may wish to add custom millwork, coffered ceilings, and custom cabinetry, or amenities such as a personal gym, an exercise pool, or a wine cellar. One can even add an elevator to provide for easy floor-to-floor access. Kurtz notes that one unit, an Avondale, is available for quick delivery. This end unit has four bedrooms and three and a half baths, with the capacity for an additional bathroom in the basement, and a custom kitchen with gorgeous designer countertops. The home, which is priced at approximately $1.350 million, will be ready by November. A new unit is a Channelle III, available with a six- to nine-month lead time. For this model, priced at $979,000, a prospective buyer can choose from an a la carte menu of options, including a selection of granite and quartz countertops, custom wood flooring, a wide array of tile selections, and beautiful kitchen cabinetry, to name a few. Early interest suggests availability in The Carriages at Lower Gwynedd won’t last long. As of October 1, with Phase III of construction underway, three of the 11 units had been claimed. To learn more about The Carriages at Lower Gwynedd, visit TheCarriagesAtLowerGwynedd.com, or contact Advantage Real Estate at (267) 614-7996 or visit AdvantageRealtyPa.com. To learn more about Harth Builders, call (215) 654-0364 or visit HarthBuilders.com.